Paramount unveiled the first poster to its imminent Anchorman sequel, which we've all been calling Anchorman 2 forever but will apparently have the brassier if more cumbersome title, Anchorman: The Legend Continues. Did we already know this? Sorry if I missed that, seriously, I'm still utterly transfixed by Peter Berg's geopolitical aplomb. Ron Burgundy couldn't hold a candle. Anyway, you'll still call it Anchorman 2, so whatever, have a look. Since Will Ferrell dropped the late-night bombshell that Anchorman 2 was a go the other week, the world's been wondering: What has Ron Burgundy been up to since 2004's Anchorman? Speaking with AM760/Salon, co-writer/director Adam McKay dropped a few hints about the sequel, which is currently being scripted. "I don’t want to give away too much, but I’ll just give a couple pieces of ideas that we’ve kicked around. Keep in mind we’re still writing the story, but I’ll say one phrase for you: custody battle. I’ll give you that. I’ll give you one other one: bowling for dollars." So... any guesses? 'I'm... Still Ron Burgundy?' Anchorman 2 is a Go! Last night Will Ferrell -- excuse me, boys and girls, San Diego newsman, jazz flautist, and scotch enthusiast Ron Burgundy -- dropped by Conan O'Brien's set to jam, give Conan unsolicited grooming tips, and OH YES -- make an announcement: "As of 0900 Mountain Time, Paramount Pictures and myself, Ronald Joseph Aaron Burgundy, have come to terms on a sequel to Anchorman." Caress some mahogany, smoke a little tea, and rejoice the good word with a clip of the historic announcement! Maybe I'm still annoyed nearly ten years after I saw Anchorman in theaters and was so angry with its juvenile, unfunny, dude-baiting humor that I'm sour to any movie whose theme is "Will Ferrell is a hilariously alpha dimwit!" 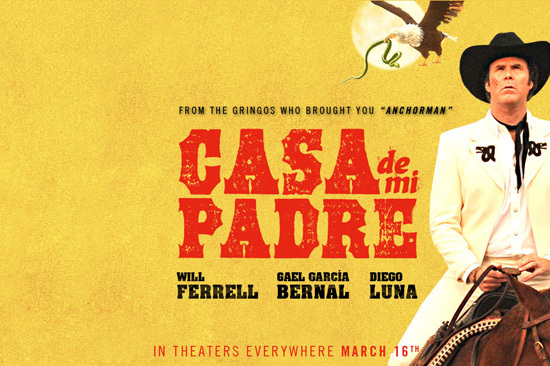 -- but I'm pretty sure Ferrell's new jam Casa de mi Padre with Gael Garcia Bernal and Diego Luna is downright moronic for real. In fact, the sophisticated-sounding title isn't a good fit for the film (though it is written entirely in Spanish) and ought to be replaced. Here are nine titles we'd consider, along with the movie's new teaser trailer.